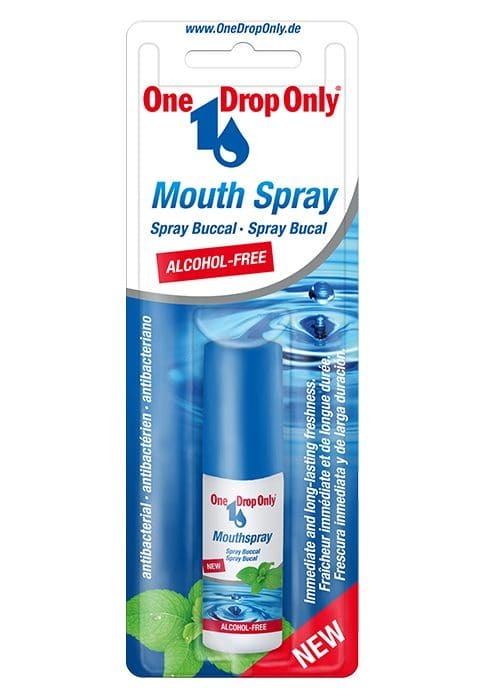 The alcohol-free One Drop Only® Mouth Spray uses natural herb extracts to support daily oral hygiene and quickly ensures fresh breath when a toothbrush is not ready to hand. The One Drop Only® Mouth Spray without alcohol uses natural herb extracts to support daily oral hygiene and quickly ensures fresh breath when a toothbrush is not ready to hand. The One Drop Only® Mouthwash Concentrate is known as THE classic mouthwash for more than 65 years! The One Drop Only® Mouthwash Concentrate is known as THE classic mouthwash for more than 65 years! It supports daily oral hygiene with antibacterial and caring ingredients. Just one drop (in 15 ml water) several times a day is sufficient to provide effective protection for the whole of your mouth and throat region. To create a more intensive taste mix several drops according to taste with an appropriate amount of water. The effective supplement to brushing your teeth daily! Rinse out thoroughly. Do not swallow. The Toothpaste Concentrate is 5-times more economical than conventional toothpastes and provides consolidated medicinal oral hygiene for teeth, tongue and gums. 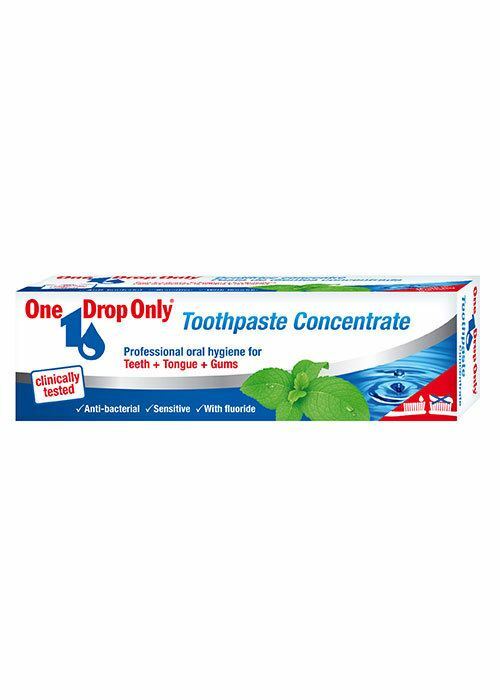 The One Drop Only® Toothpaste Concentrate is 5-times more economical than conventional toothpaste and provides consolidated medicinal oral hygiene for teeth, tongue and gums. Use sparingly during each cleaning procedure (amount approx. equivalent to the size of a pea). The One Drop Only® Mouth Spray uses natural herb extracts to support daily oral hygiene and quickly ensures fresh breath, when a toothbrush is not ready to hand. The One Drop Only® Mouth Spray uses natural herb extracts to support daily oral hygiene and quickly ensures fresh breath when a toothbrush is not ready to hand. 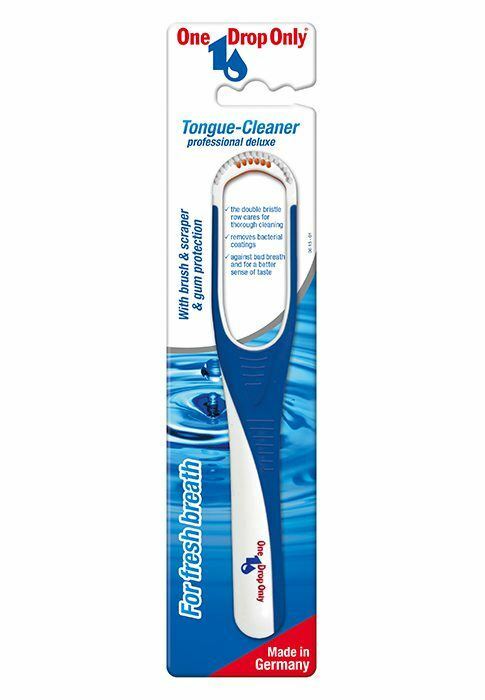 The One Drop Only® Tongue-Cleaner professional deluxe is a combination of tongue brush and tongue scraper for soft but thorough cleaning of the sensitive back of the tongue. The One Drop Only® Tongue-Cleaner professional deluxe is a combination of tongue brush and tongue scraper for soft but thorough cleaning of the sensitive back of the tongue. Coatings on the tongue are loosened with the brush side before being removed from the back of the tongue using the scraper side. Brush your outstretched tongue several times with the brush side from the back to the front of your tongue. Turn the tongue-cleaner over and repeat the same movements with the scraper side. Use 1 to 2 x daily. Clean the tongue-cleaner after use under running water like a toothbrush. Renew after 4 to 6 weeks. The One Drop Only® medical toothbrush was developed especially for sensitive teeth and irritated gums. The soft bristles ensure a thorough and gentle cleaning in particular for tooth necks and gum margin. Brush your teeth after every meal, but at least twice daily. Exchange your toothbrush every 3 months. 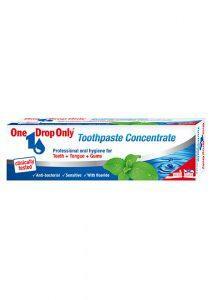 We recommend the use of our One Drop Only® Toothpaste Concentrate. 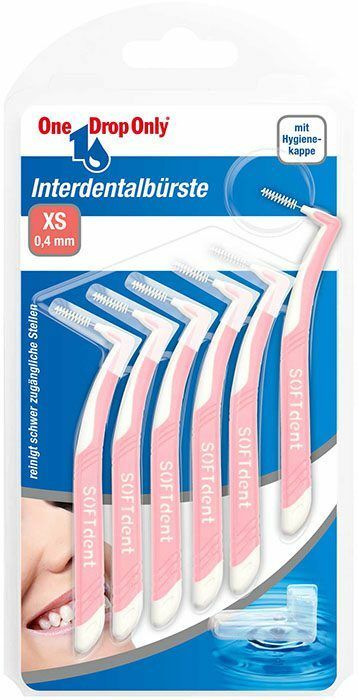 Due to its low abrasion it assures a very gentle cleaning of the teeth. The antibacterial One Drop Only® Mouthwash EFFECTIV Classic offers a well-balanced protection throughout the oral cavity. new formula – without parabens! Use twice daily after brushing your teeth with approx. 20 ml per application (see marking in the screw top) undiluted. Rinse around your mouth for 30 seconds. Suitable for children 6 years or older if they have learned how to use mouthwash. Up to twice daily with 10 ml per application. With its special gum care formula, the One Drop Only® Mouthwash EFFEKTIV Gingival contributes to firm and healthy gums. For daily use, 2 x daily after brushing your teeth with approx. 20 ml per application (see marking in the screw top), rinse around the mouth undiluted for 30 seconds. Our One Drop Only® Interdental brushes assure a thoroughly cleaning of the interdental spaces, that a normal toothbrush cannot reach. Bend the brush into the most easily usable shape if necessary, put it into the interdental area and move backwards and forwards several times. Do not try to use force, but rather use a smaller size. For daily use. Renew the brush at least once a week. The One Drop Only® Naturals toothpaste with essences of mint and aloe vera from controlled organic cultivation protects against caries, prevents plaque formation and cares for the gums. 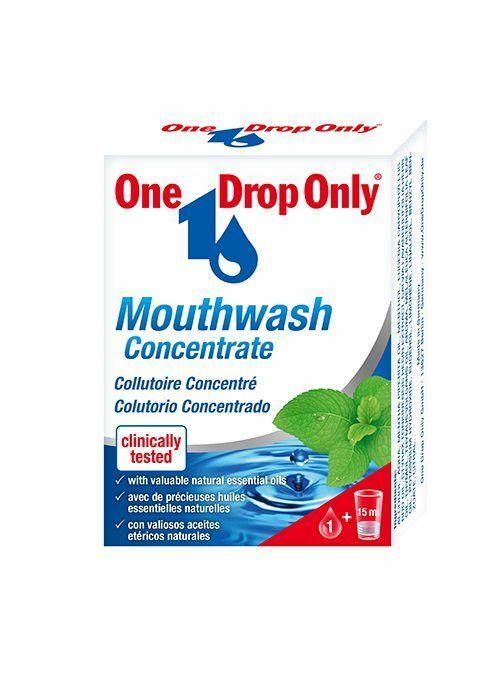 The One Drop Only PHARMACIA Mouthwash for the Care of Dry Mouth refreshes & moisturizes the oral cavity. 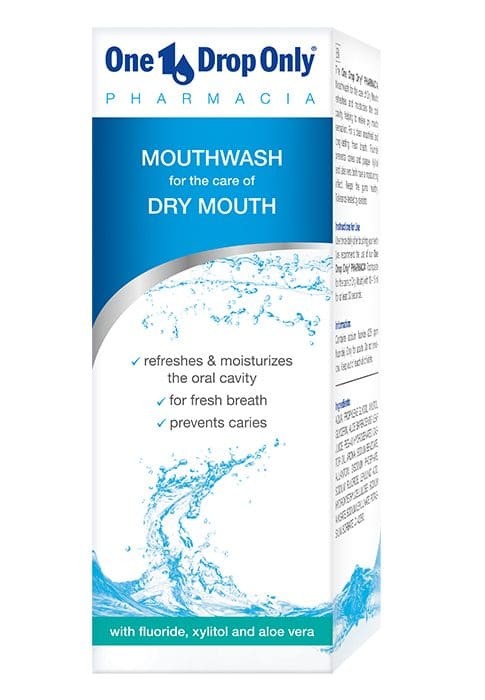 The One Drop Only PHARMACIA Mouthwash for the Care of Dry Mouth was especially developed for the care of dry mouth. lnstructions for Use: Use twice daily after brushing your teeth (we recommend the use of our One Drop Only® PHARMACIA Toothpaste for the care of Dry Mouth) with 10–15 ml for at least 30 seconds. 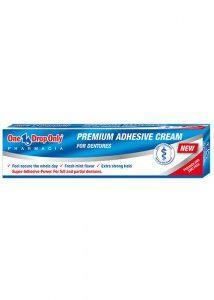 The One Drop Only PHARMACIA Toothpaste for the Care of Dry Mouth refreshes & moisturizes the oral cavity. 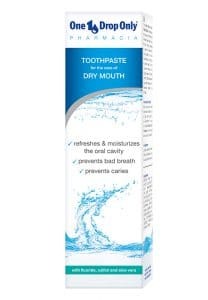 The One Drop Only PHARMACIA Toothpaste for the Care of Dry Mouth was especially developed for the care of Dry Mouth. lnstructions for Use: Brush your teeth after each meal, at least twice a day. After brushing, we recommend the use of our One Drop Only® PHARMACIA Mouthwash for the care of Dry Mouth. The Tongue Cleaning Set helps to get rid of bad breath by removing bacterial tongue coating using a tongue gel plus a tongue cleaner. Apply 1 – 2 drops of the gel on the bristle of the Tongue Cleaner and spread on the tongue with constant gentle pressure. Turn the Tongue Cleaner over and remove the loosened coatings, drawing the scraper side from the back to the front. Rinse your mouth with water. Clean the Tongue Cleaner after each use under warm water. Use the Tongue Cleaner regularly 1 – 2 times a day and take a fresh one after 4 – 6 weeks. The One Drop Only® PHARMACIA PREMIUM Denture Adhesive Cream offers extra strong hold for a safer and more comfortable wearing of your dentures. Clean dentures thoroughly and let them dry. Apply 2-3 stripes of the adhesive cream. Insert dentures and bite down or press dentures briefly. The One Drop Only® PHARMACIA ONDROHEXIDIN Mouthwash for mild cleansing and care of the mouth and throat helps to maintain teeth and gums healthy. The One Drop Only® PHARMACIA ONDROHEXIDIN Mouthwash for mild cleansing and care of the mouth and throat helps to maintain teeth and gums healthy. Chlorhexidindigluconat and CPC have a long-lasting antibacterial effect and prevent plaque formation effectively. Use twice daily, preferably in the mornings and evenings after cleaning your teeth, rinse your mouth with 10 – 15 ml (measuring cap) Ondrohexidin undiluted for at least 30 seconds. Do not swallow, do not rinse with water afterwards. The One Drop Only® PHARMACIA ONDROHEXIDIN Toothpaste cleans and cares for teeth and gums. The One Drop Only® PHARMACIA ONDROHEXIDIN Toothpaste cleans and cares for teeth and gums. Chlorhexidindigluconat and CPC have a long-lasting antibacterial effect and help to prevent plaque effectively. For daily use. Brush your teeth after every meal (at least twice daily) for 3 minutes using the ONDROHEXIDIN toothpaste. We recommend the use of One Drop Only® PHARMACIA ONDROHEXIDIN Mouthwash after brushing your teeth. The One Drop Only® PHARMACIA Denture Brush cleans dentures thoroughly. The flat bristle side with different long and hard filaments provides an optimal cleaning of the outer denture surface. The slanted shape of the small bristle side reaches the interspaces and inner surfaces of the dentures easily. Clean the dentures at least once daily with the denture brush. Let water run in the sink and clean the dentures from all sides with the One Drop Only® PHARMACIA denture brush by using the different bristle areas. Make sure that food residues in the interdental spaces and the space for the jaw ridge have been removed. Rinse with clear water after usage. The alcohol-free mouthwash fresh serves as a supplement to the daily oral hygiene and offers optimal protection - for healthy teeth and gums. 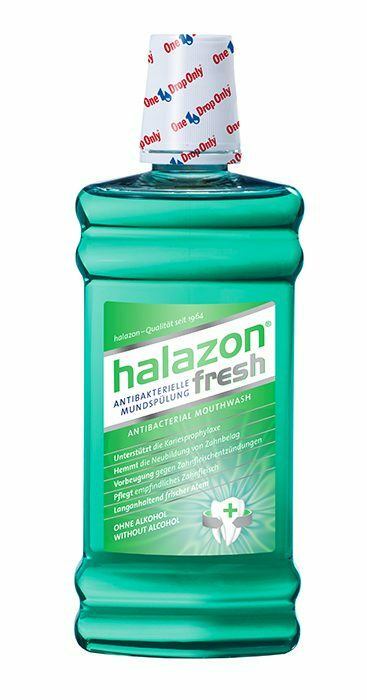 The alcohol-free halazon® mouthwash fresh serves as a supplement to the daily oral hygiene and offers optimal protection – for healthy teeth and gums. Ready-to-use mouthwash for the undiluted application. 2 x daily after cleaning your teeth, e. g. with halazon® fresh toothpaste using 20 ml (see marking in the screw top) per application, rinse around the mouth for 30 seconds. Do not swallow. The antibacterial toothpaste fresh refreshes and protects! The strong aroma creates a long-lasting freshness throughout the mouth. 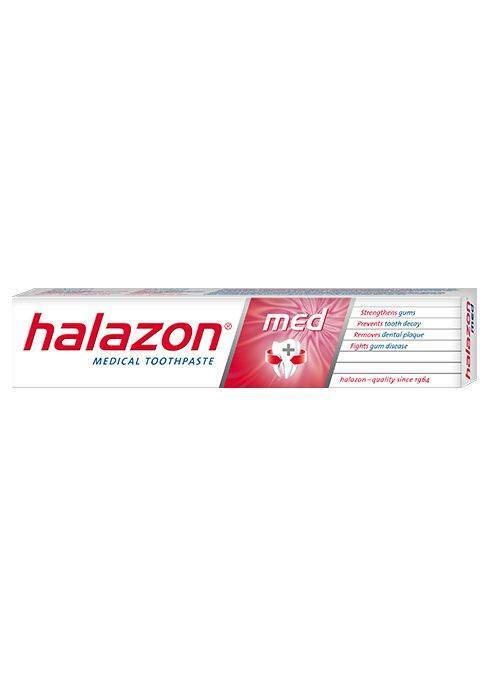 The halazon® antibacterial toothpaste provides long-lasting freshness! The extra strong aroma creates a long-lasting freshness throughout the mouth. The active substance formula with fluoride, CPC and allantoine protects the teeth from caries, helps to prevent plaque effectively and cares for the gums. For daily use. For adults and children over 6 years old. The medical toothpaste med actively prevents periodontitis and tooth decay. 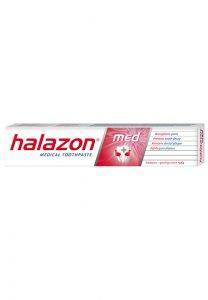 The halazon® med medical toothpaste actively prevents periodontitis and tooth decay. The special combination of active ingredients inhibits plaque formation for a long time, has a noticeable astringent effect and tightens and strengthens the gums. At the same time, the fluorine substance ensures an effective caries prophylaxis and hardens the dental enamel. For daily use. For adults and for children over 6 years old, especially suitable for people with acute gum disorders, and in the case of a tendency towards bleeding gums. The multiactive toothpaste white with its abrasives cleans the teeth thoroughly and assures naturally white and beautiful teeth. 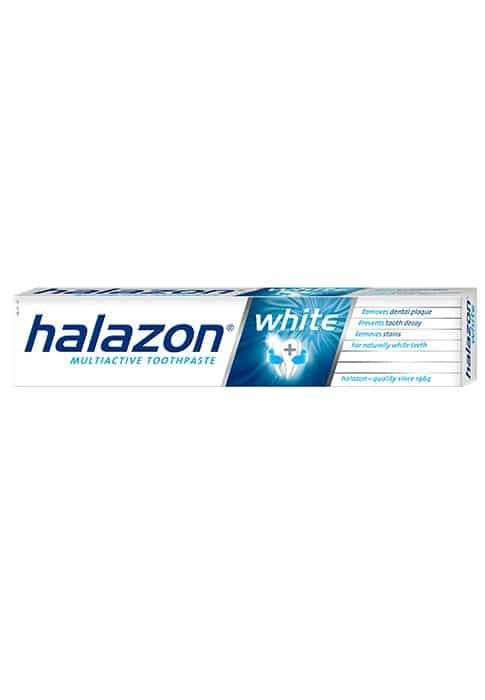 The halazon® white multiactive toothpaste with its abrasives cleans the teeth thoroughly and assures naturally white and beautiful teeth. Even stubborn plaque caused by coffee, tea, red wine or nicotine is being removed. For daily use. Suitable for adults. 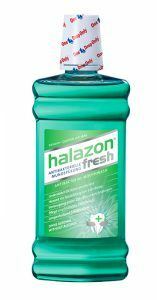 The halazon® mouth spray fresh is the perfect companion for on-the-go. Simply spray into your mouth! Sufficient for approx. 120 applications. The medical mouth spray med is the ideal companion for on-the-go and has an antibacterial effect. 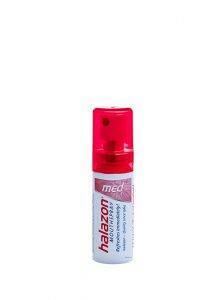 The medical halazon® mouth spray med is the ideal companion for on-the-go and has an antibacterial effect.